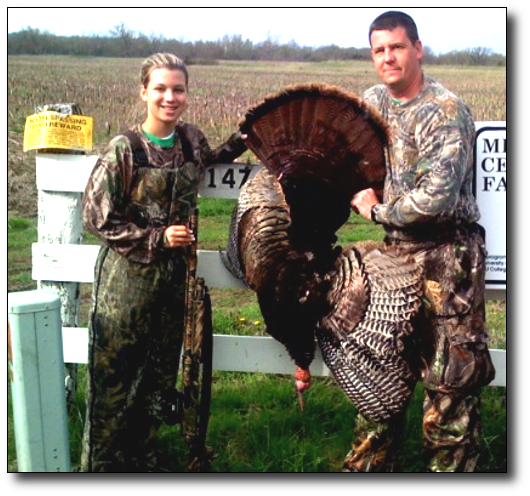 We had to get up early opening morning because it was an hour drive to the HSP farm that my Dad and uncle usually turkey hunt. My uncle went on one side of the farm and we went to the other. We sat in the middle of some brush because my dad did not want to have to carry a blind. My dad forgot his hen decoy so all we had was his new Pretty Boy, full strut decoy. When daylight came, we sat and did not hear any turkeys on the farm we were hunting. I know it was early but I was getting discouraged. I really wanted to get my first Gobbler. I had killed a Jake last year but never and adult bird. Shortly after Daylight, my dad said he saw a turkey in the field we were watching. He was about 200 yards away. He never gobbled. He practically ran toward our decoy. I told my dad that he was coming to fast and that I would not be able to shoot. He told me that he would stop when he got to the decoy. The gobbler ran up to the decoy and went into full strut. He was about 19 yards away. My dad and uncle always told me never to shoot one in full strut. When he finally popped his head up, my dad said to shoot. He went down and I had no doubt that I had bagged my first gobbler.